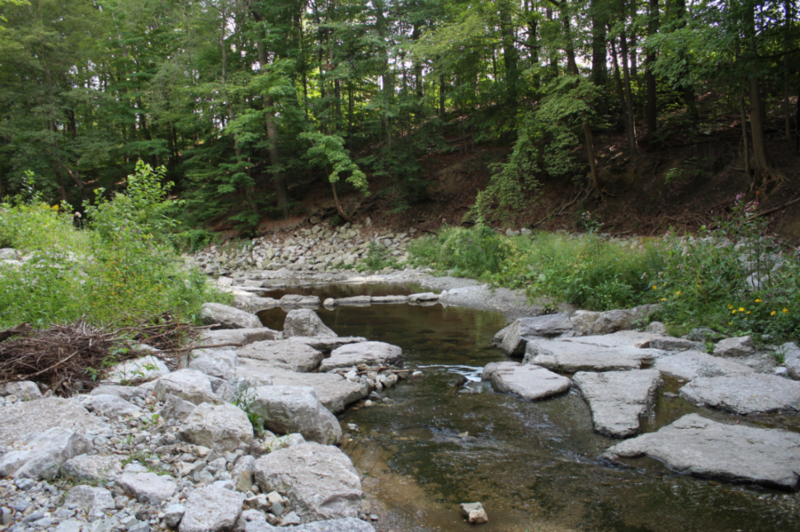 The City of Toronto has completed a Municipal Class Environmental Assessment (EA) Master Plan to identify solutions to reduce erosion, restore and rehabilitate, and protect City sewer infrastructure in Chapman Valley. A Master Plan study report was placed on public record for a 30-day review period from January 3 to February 1, 2019. The study has now concluded. The study area is divided into four sections (or reaches) along the Humber Creek. 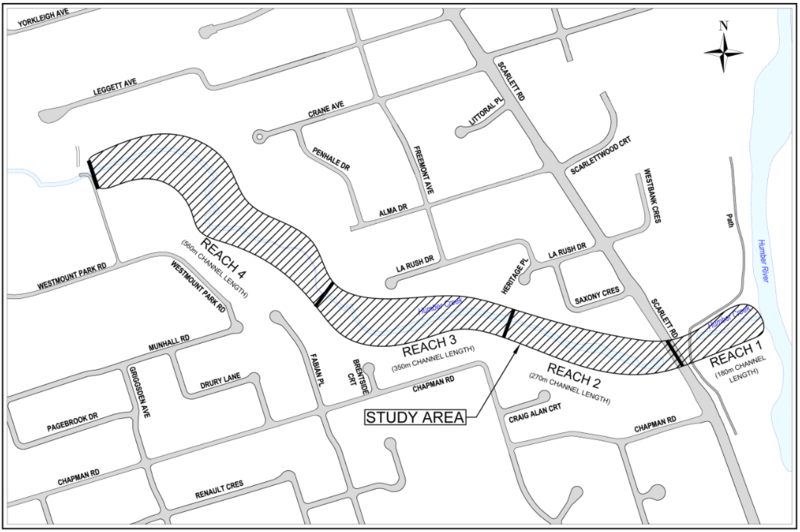 Reach 1 is downstream of Scarlett Road while Reaches 2, 3 and 4 are upstream. Each reach maintains a separate restoration plan and recommendations. Read more about the Completed Study in the Executive Summary tab. In 2003, Chapman Valley was identified in the City’s Wet Weather Flow Master Plan as a priority site in need of repair. The study is being conducted under the Master Planning provisions of the Municipal Class EA process (amended 2007). The Class EA process will provide members of the public and interest groups with opportunities for input to this study. The study will define the problem, consider and evaluate alternative solutions, assess impacts of the proposed solutions, and identify measures to lessen any adverse impacts. This Humber Creek restoration work was taken to address a single area of the creek with other areas still in need of rehabilitation. Thanks to all who attended the Public Drop-in Event on July 18, 2018. You can view the notice for more information. Toronto Water is leading the Humber Creek in Chapman Valley – Erosion Control and Creek Restoration Master Plan Class Environmental Assessment, consistent with the Master Planning provisions of the Municipal Class EA Process (amended 2011), as well as the City of Toronto’s Ravine Strategy (adopted 2017). Through the application of environmental assessment planning principles, an evaluation of options was undertaken using a broad based process, including consideration of environmental, social, economic, and functional criteria. The intent of the Master Plan is to provide an implementation program over the ~10 year horizon for the preferred alternatives defined through the study. The Master Planning Approach #2 was followed for this project, where the level of investigation, consultation and documentation are sufficient to fulfill the requirement of Schedule B projects. The Ravine Strategy, developed by Parks, Forestry and Recreation, City Planning, Toronto Water, TRCA, and key stakeholders, sets out a vision with corresponding actions to guide the City in future decision making related to ravines, while addressing the challenges and opportunities associated with a wide range of varying interests. The Chapman Valley, designated as an Environmentally Sensitive Area (ESA), provides a conduit for Humber Creek and associated storm water flows, with an upstream drainage area of 815 hectares. This area is contained within the Humber River watershed, and is located within the westerly portion of Toronto, bounded by Scarlett Road, Rexdale Boulevard, Martingrove Road, and Eglinton Avenue. The majority of this area was rapidly developed in the 1950’s through 1960’s, beginning with residential and subsequent industrial development which altered the hydrologic characteristics of the subwatershed, significantly increasing flows within Humber Creek. The corridor also maintains a sanitary trunk sewer, constructed in 1950s, which was open cut through the valley and intersects the channel in a number of locations. At the time of construction, the sanitary sewer was entirely buried, inset into the shale bedrock well below the bed of the channel. The primary risk with exposed sanitary pipes and manholes are pipe failure, which result in sewage spilling into the creek corridor, negatively impacting water quality, aquatic habitat, and public safety. Also, surcharges can occur to the sewer system, exceeding thresholds for treatment at the receiving treatment plant. Storm sewer outfalls have failed as a result of channel erosion undermining the structures, which has created extended pipe failures, along with local scour and erosion issues around the outfalls. Erosion and channel degradation adjacent to the valley walls have created oversteepened and unstable slopes, with loss of private properties, failing fencelines, and continued slope regression expected to occur. 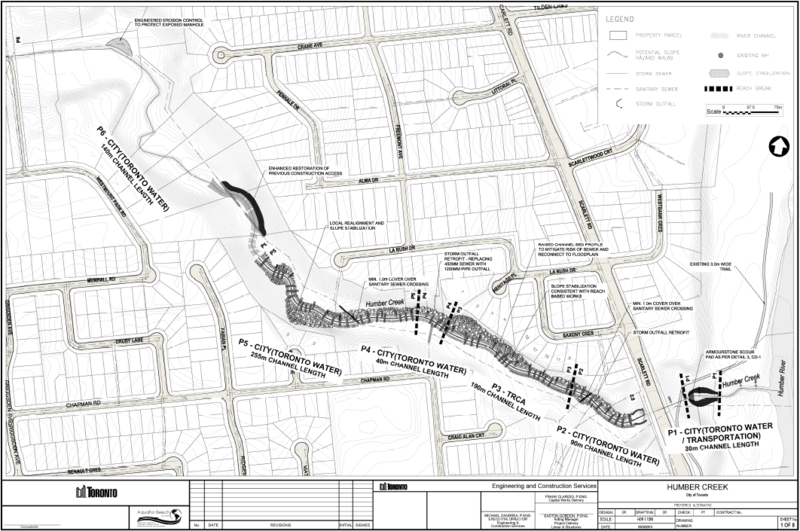 There is a significant network of informal trails through the study area, many of which are at unsafe proximities to vertical creek banks over 2 metres in height. 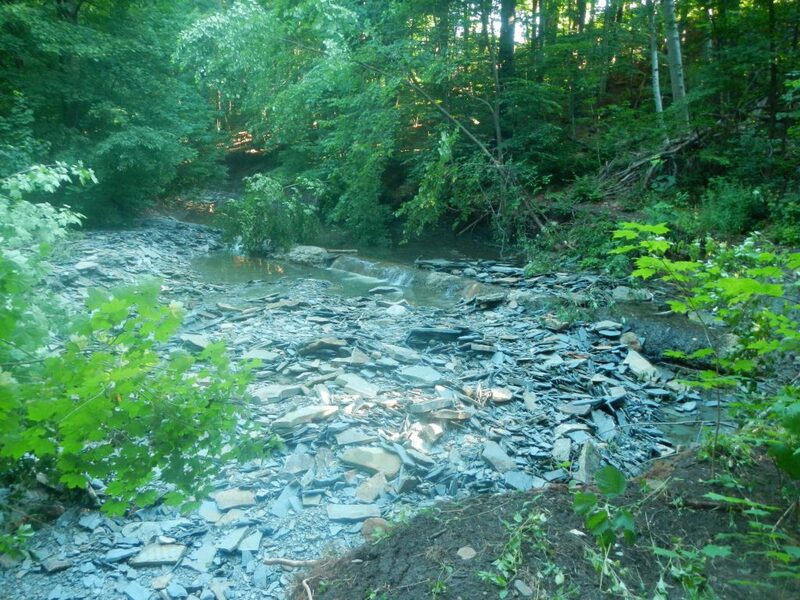 The mass erosion of Humber Creek has undermined mature trees along the length of the channel. Additional impacts include negative impacts to water quality and aquatic habitat associated with erosion. The rapid channel incision, which has one of the largest rates in the Greater Toronto Area, is caused by exposure of the Georgian shale bedrock to oxygen in air, and subsequent weathering and redox processes. A key part of the solution for reducing the weathering rate is to minimize the future exposure of the shale bedrock to air. Consultation, an essential requirement of the Municipal Class EA process, included the identification of interested and potentially affected parties, and informing them about the project in an effort to solicit knowledge of the local environment and receive input about key project decisions. Consultation and outreach activities occurred with regulatory and approval agencies, members of the public, public agencies, Indigenous communities, the City Councillor, with the Notice of Commencement distributed via Canada Post to 3,000 properties in the project’s study area. Alternatives considered in the evaluation methodology included the Null option (Alternative No. 1 – leaving the existing channel to continue actively eroding, downcutting, and depositing excessive bedrock particles throughout the channel system), Local Restoration (Alternative No. 2 – site scale solution provided at one or more problem locations within a reach), and Reach Scale Restoration (Alternative No. 3 – reconstruction of the complete stream reach). Each alternative was evaluated based on a set of physical, natural environment, social, cultural, and economic criteria. Physical and natural environment factors included erosion, water quality, aquatic habitat, terrestrial habitat, and terrestrial vegetation. Social and cultural factors included public safety, landowner impacts, benefit to community, and aesthetic value. Technical and engineering factors included impact on existing infrastructure and lifespan of works. Economic factors included capital cost and operations and maintenance costs. A Public Information Centre (PIC) offered interested residents an opportunity to drop-in at their convenience to speak with City staff and consultants and review display boards regarding the project findings. The PIC was attended by approximately 20 people, with most attendees local residents to the study area with properties that backed onto the Chapman ravine. A feedback form was provided to the attendees to solicit input on the project. Following the event, the City received 26 email comments and 2 written comments from the meeting. Most comments involved opposition to the proposed hard surface (asphalt) trail connecting Chapman Road to Scarlett Road. Based on this public feedback, the existing natural surface trail will be retained. The remainder of the comments were supportive of the preferred alternative presented at the PIC, details of which are summarized in the report. Based on the understanding of existing conditions and the preferred strategy for addressing risks throughout the study area, an implementation plan has been developed. Six (6) distinct projects have been delineated based on risks, as well as department or agency interests. The prioritization has identified projects in which emergent conditions exist with immediate actions recommended, as well as projects which may be considered over the longer 5 – 10 year horizon. For the longer term projects, although future levels of risk have been anticipated, monitoring is recommended by the relevant agency to ensure conditions haven’t worsened such that an expedited timeframe should be considered. A summary table of the proposed projects is included below, along with a figure illustrating the extents of each project at the end of the summary.